You can create a new repository by using CodeCommit, and use it as your r10k remote control repository. To complete steps in this section, and work with an CodeCommit repository, you need an IAM user that has the AWSCodeCommitReadOnly managed policy attached. For more information about how to create an IAM user, see Creating an IAM User in Your AWS Account. In the CodeCommit console, create a new repository. Choose Skip to skip setting up an Amazon SNS topic. On the Code page, choose Connect to your repository. On the Connect to your repository page, choose HTTPS as the Connection type, and choose your operating system. 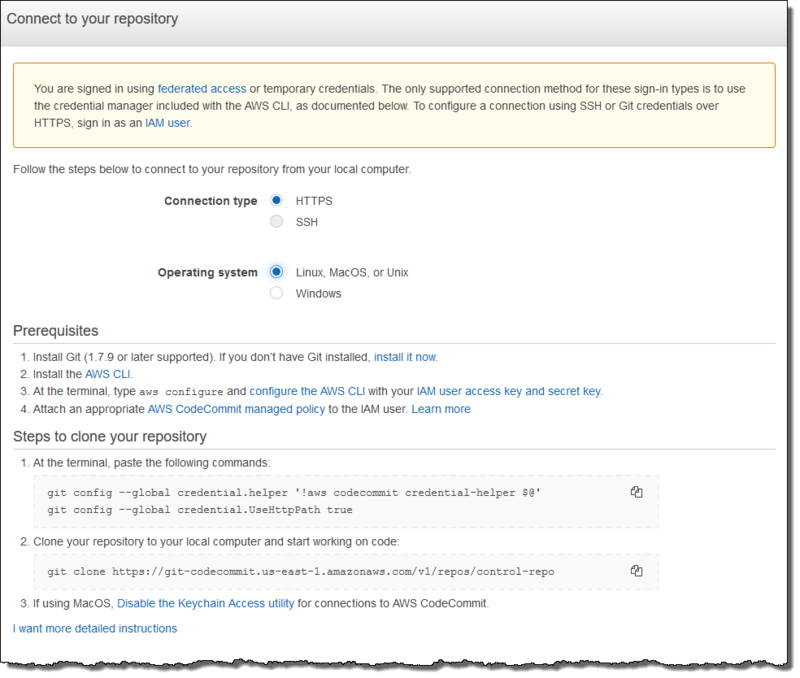 In the Steps to clone your repository area, your git clone URL should resemble the following: https://git-codecommit.region.amazonaws.com/v1/repos/control-repo. Copy this URL to a convenient place for use in Puppet server setup. 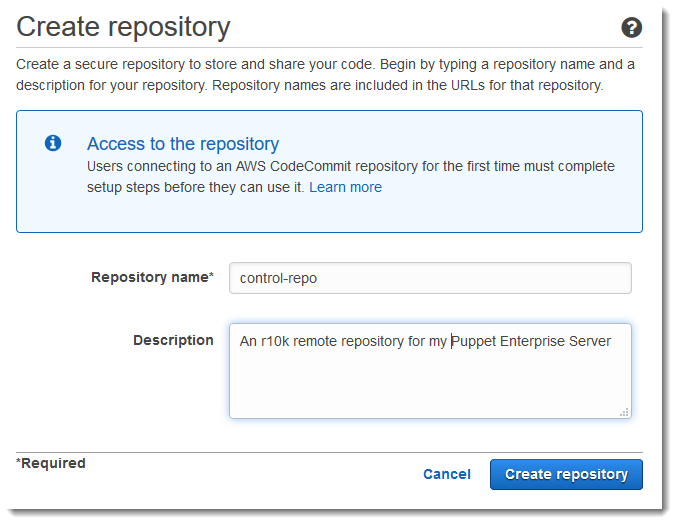 Close the Connect to your repository page, and return to the OpsWorks for Puppet Enterprise server setup. Paste the URL that you copied in Step 4 in the r10k remote string box in the Configure credentials page of the Puppet master setup wizard. Leave the r10k private key box empty. Finish creating and launching your Puppet master. In the IAM console, attach the AWSCodeCommitReadOnly policy to the instance profile role of your Puppet master. For more information about how to attach a policy to an IAM role, see Attaching Managed Policies in the IAM User Guide. Follow the steps in Setup for HTTPS Users Using Git Credentials in the CodeCommit User Guide to push your existing control-repo content to the new CodeCommit repository. Now, you can continue by following the instructions in Configure the Puppet Master Using the Starter Kit, and use the Starter Kit to deploy code to your Puppet master. The following command is an example. You can configure an CodeCommit r10k remote control repository to use SSH key pair authentication. The following prerequisites must be completed before you start this procedure. You must have launched your OpsWorks for Puppet Enterprise server with an HTTPS control repository as described in the preceding section, Step 1: Use CodeCommit as a Repository with an HTTPS connection type. This must be completed first so you can upload the required configuration to the Puppet master. Be sure you have an IAM user with the AWSCodeCommitReadOnly managed policy attached. For more information about how to create an IAM user, see Creating an IAM User in Your AWS Account in the AWS Identity and Access Management User Guide. Create and associate an SSH key with your IAM user. Follow instructions for creating a public/private key pair with ssh-keygen in Step 3: Configure Credentials on Linux, macOS, or Unix in the CodeCommit User Guide. In an AWS CLI session, run the following command to upload the private key file contents to AWS Systems Manager Parameter Store. Your OpsWorks for Puppet Enterprise server queries this parameter to get a required certificate file. Replace private_key_file with the path to your SSH private key file. aws ssm put-parameter --name puppet_user_pk --type String --value "`cat private_key_file`"
Add Systems Manager Parameter Store permissions to your Puppet master. In the Search bar, enter AmazonEC2RoleforSSM. In the search results, choose AmazonEC2RoleforSSM. Create the configuration file manifest. If you are using the control-repo-example repository provided in the starter kit, create the following files in the locations shown in the example repository. Otherwise, create them according to your own control repository structure. Replace the IAM_USER_SSH_KEY value with the SSH key ID you created in the prerequisites for this procedure. # Replace REGION with the correct region for your server. Push your control repository to CodeCommit. Run the following commands to push the new manifest file to your repository. Deploy the manifest files. Run the following commands to deploy the updated configuration to your OpsWorks for Puppet Enterprise server. Replace STARTER_KIT_DIRECTORY with the path to your Puppet configuration files. Update the OpsWorks for Puppet Enterprise server's classification. By default, the Puppet agent runs on nodes (including the master) every 30 minutes. To avoid waiting, you can manually run the agent on the Puppet master. Running the agent picks up the new manifest file. On the Configuration tab, enter profile::codecommit in Add new class. The new class, profile::codecommit, might not appear immediately after running puppet-code deploy. Choose Refresh on this page if it does not appear. Choose Add class, and then choose Commit 1 change. Manually run the Puppet agent on the OpsWorks for Puppet Enterprise server. Choose Nodes, choose your server in the list, choose Run Puppet, and then choose Run. In the Puppet Enterprise console, change the repository URL to use SSH instead of HTTPS. The configuration you perform in these steps is saved during the OpsWorks for Puppet Enterprise backup and restoration process, so you do not need to manually change the repository configuration after maintenance activities. On the Configuration tab, find the puppet_enterprise::profile::master class. Choose Edit next to the r10k_remote parameter. Replace the HTTPS URL with the SSH URL for your repository, and then choose Commit 1 change.